The president falsely says she got $700,000 in donations from Hillary Clinton for a Virginia state Senate race. WEST PALM BEACH, Fla. — President Trump reacted to reports Saturday about the coming retirement of FBI Deputy Director Andrew McCabe, who has been buffeted by attacks from the president and his Republican allies over alleged anti-Trump bias in the agency, by retweeting falsehoods about McCabe’s wife. “How can FBI Deputy Director Andrew McCabe, the man in charge, along with leakin’ James Comey, of the Phony Hillary Clinton investigation (including her 33,000 illegally deleted emails) be given $700,000 for wife’s campaign by Clinton Puppets during investigation?” Trump tweeted. McCabe spent hours behind closed doors on Capitol Hill last week answering questions from lawmakers on two separate committees as part of a new investigation of the FBI and its 2016 inquiry into Clinton’s email practices when she was secretary of state. His role supervising the email investigation has come under renewed scrutiny. But Trump’s tweet is incorrect. McCabe’s wife, Jill, did not get $700,000 in donations from Clinton for a Virginia state Senate race in 2015. The money came from Virginia Gov. Terry McAuliffe’s political action committee and the Virginia Democratic Party and was donated before McCabe was promoted to deputy director and assumed a supervisory role in the Clinton email investigation. McAuliffe is a longtime supporter of Hillary Clinton and her husband, former President Clinton. 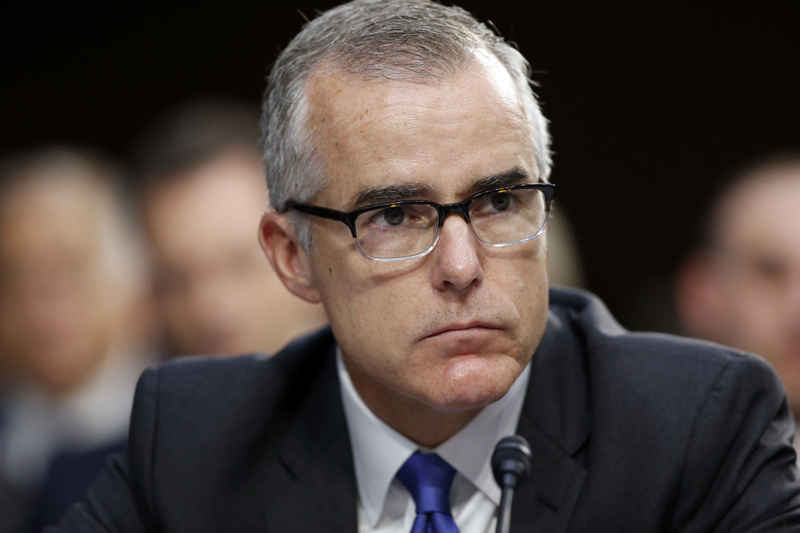 McCabe plans to retire in about 90 days, when he becomes fully eligible for pension benefits, The Washington Post reported Saturday, citing people familiar with the situation. Trump and his allies have made it clear they want McCabe out of the FBI. But McCabe is a civil service employee who cannot be fired without clear evidence of wrongdoing. The FBI declined to comment on McCabe’s plans. Republicans charge that an anti-Trump bias exists in the bureau’s ranks, citing the campaign donations to McCabe’s wife and, more recently, the release of hundreds of text messages between FBI counterintelligence agent Peter Strzok and FBI lawyer Lisa Page. Strzok and Page used words like “idiot” and “loathsome human” to describe Trump during the campaign. Strzok was removed from the team of special counsel Robert Mueller, who is leading the Russia investigation, over the summer after the text messages surfaced.